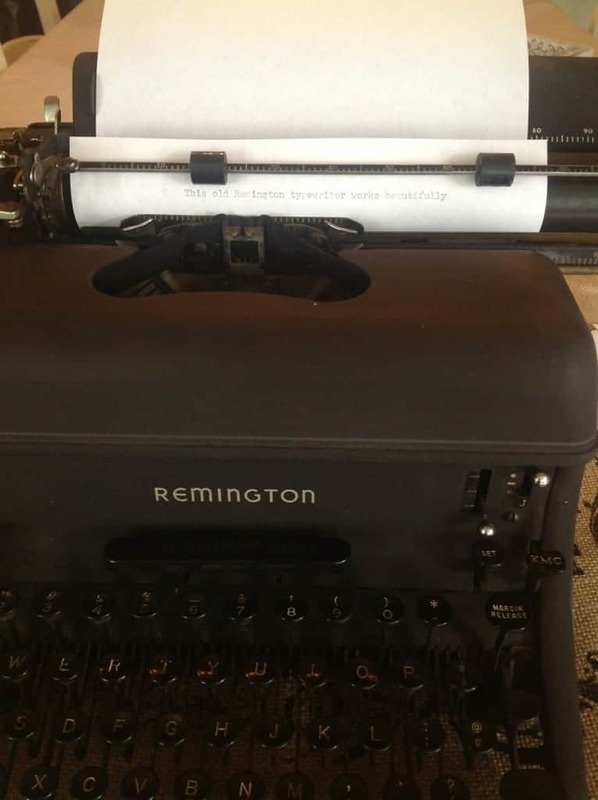 I picked up this Remington Rand typewriter today…a $20 find on Craigslist. VERY excited as I’ve been coveting these for awhile, so I know this is a very good bargain. I started researching the Remington brand at this site, and it appears that mine is a Model No. 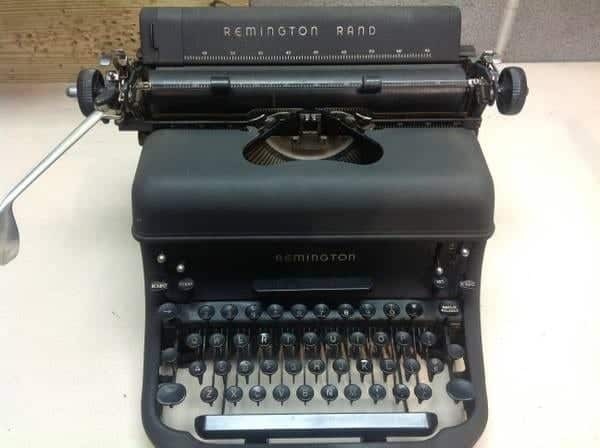 17…a World War II era typewriter. I knew my kids would love this because they were like moths to a flame every time we visited a vintage store. They seemed fascinated by the mechanics of it…something I loved to see. It works like a charm. And my daughter can be heard typing, keys snapping away in the background as I type this. “Antiquing can be fun,” she says. When I was eight years old, my family started an antique show that was held once per month. Vendors came in from all over the eastern part of the country to set up. We would spend the entire month preparing for that single day. My earliest job was handling incoming phone calls when potential dealers would call to book their booth. I had to learn to be professional on the phone (even at 8), take proper phone messages with details, and to be ready to answer basic questions about the show. Enough information that an adult family member could call them back. On the day of the show, I would get up at 2 or 3 a.m. along with the rest of the family. I admittedly slept on the way there, but once we arrived, I was expected to work just like everyone else. After we flipped tables that were reserved for the 100 or so vendors, I would place numbers on the tables so that vendors could find their location upon arrival. 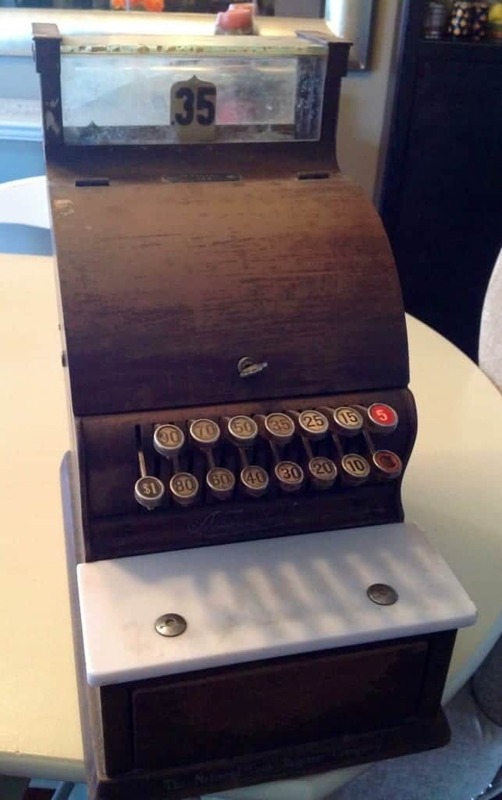 My next job was to man the “coffee window” and had the chance to use an old cash register like the one pictured below. I eventually learned how to make change for larger bills. My Grandmothers were always nearby to bail me out if I got confused making change, but I grasped it eventually with full mastery of the skill as I got older. People were always very kind, and made sure they gave the little girl behind the window exact change whenever possible. One day per month doesn’t seem like much, but it was a long one. I remember extreme exhaustion towards the end of the day, and I never missed school which was the very next day. Throughout the show I would take breaks and sit with my mother to work the admission desk, or occasionally walk around the entire arena and check out cool ephemera, vintage pictures, old signage, baseball cards, old tools…and through osmosis I knew about some of the most obscure items and their practical use. My Grandmother was always very well educated on some of the strangest items, and was a very well-liked lady who knew all the vendors. She was fun to walk around with. I’d often make rounds with her and talk to the dealers, and if I found something that interested me, I’d take a family member out to show them. I started collecting dolls around that time (Nancy Ann Storybook dolls) and eventually I had quite a menagerie of items I acquired over the years. My family sold the antique show when I was fifteen. While it provided me with a solid foundation for curating old items, as well as upcycling and repurposing, I have to re-learn a bit. Admittedly, I was a bit burnt out on antiques in my early 20’s (like anyone starting out on their own, I wanted new items). Eventually, I came to appreciate the character that antiques can offer my builders-bland home, and I am gaining momentum with antiquing again. I do worry that my kids are devoid of that kind of exposure, so I’m very excited when I see them enjoying thrifting and repurposing as a way to get lost in yesteryear. 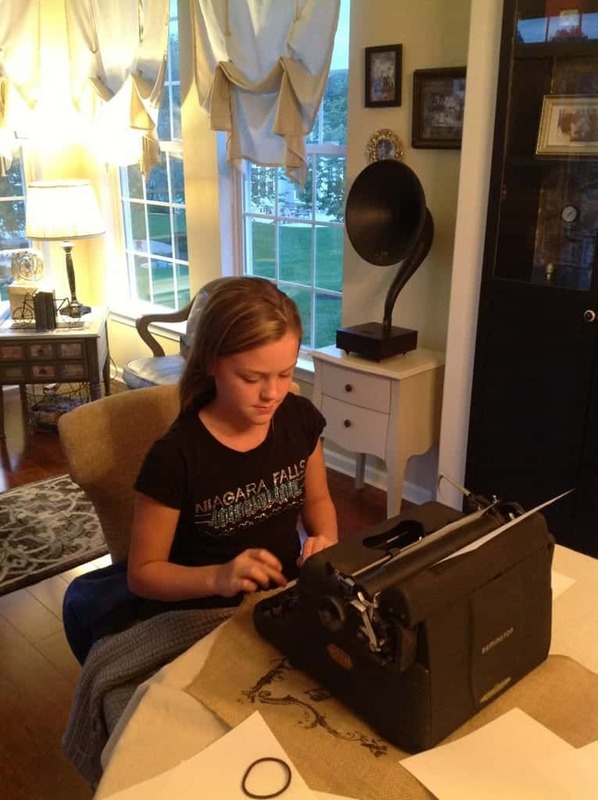 As I sit here and type this on a Sunday evening, my daughter is up to 8 stories on our new, vintage Remington…and has been anxiously reading each and every silly snippet to me. Something about hearing the keys snap in the background makes her feel like she’s “working”. I asked her why she was enjoying it so much, since she has iPads, laptops, desktops available. And she said “because I feel like a REAL author, just like the olden days”. And to this I say…mission accomplished.